The Rock Solid Baby Side Arm Kit is designed to mount tables, lights, cameras and other gear in versatile and optimal ways. The Baby Side Arm Kit includes a Rock Solid Baby Arm, Master Clamp and Aero Elbow and offers a secure and versatile way to mount any 5/8”(16mm) Baby accessory to a round or flat surface. 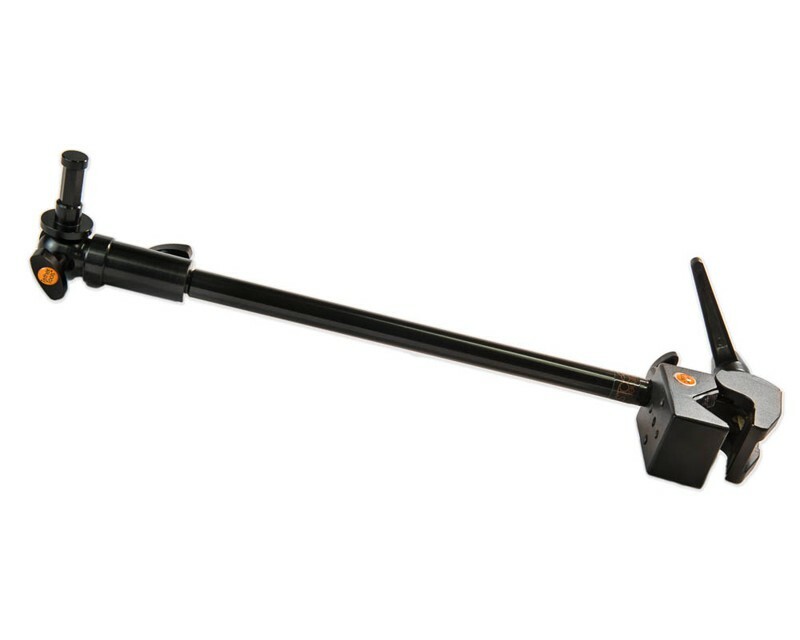 The Baby Side Arm Kit is ideal for mounting a Tether Table or Wallee iPad Connect to a light stand or tripod. Simply attach the Master Clamp to any column or flat surface and insert the Extension Arm and Elbow. Adjust to the desired angle and lock all joints in place, then secure grip gear on the elbow using the 5/8”(16mm) Baby pin. The Rock Solid Baby Arm Kit extends 11.75″ (29.85cm) from the column and is compatible with the complete range of Tether Table Aeros. The entire kit is constructed of aerospace aluminum, including joints, knobs and handles. The Rock Solid Baby Side Arm Kit is made in the USA and offers the Tether Tools’ Lifetime Warranty. The Rock Solid Master Clamp features a 5/8″ Baby stud, stud receptor and ¼”-20 threads. The Aero Elbow is designed with TruVu locking technology which adds versatility and secure placement of equipment. The Elbow has a 5/8″ (16mm) Baby stud on one end and has a 5/8″(16mm) Baby receptor, as well as a 1 1/8″ (2.85cm) Junior Male Stud, and can be independently secured to any grip gear such as light stands, booms or Master Clamps.The Aero Elbow provides 180 degrees tilt and 360 degrees rotation. * The Rock Solid Baby Side Arm Kit is rated to hold equipment up to 18lbs(8.2kg). However, always refer to maximum load limits on stands and clamps. Those weight limitations ALWAYS take precedence. The use of a sandbag is always recommended. This listing is for the Aero Baby Side Arm Kit only. All other items pictured are sold separately.